Well, after a week off to take care of my table at ConQuest, I'm back in the saddle for another week of Science Fiction Fantasy Saturday posting. I will, however, mention that because of some impending surgery (Friday), I may be a bit slow getting around to all of the other posts to leave comments. To keep things in line with my previous post, I'm pulling another snippet from my standalone novel, The Cure..
Last week, we were playing with zombie mice. This week, Mila is confronted by a pair of Guardians, religious zealots on her planet, who've come to provide a "warning" to her. She looked around for anything to aid in her defense. These two hadn’t just come to give her a warning. If they’d not meant to harm her, they could have just phoned in their warning. She’d known these people were here for it, but the fact they mentioned it by name still shocked her. Unfortunately, it seems that "secret" projects haven't stayed secret...and maybe, if you're all good, I'll continue this snippet where it left off next week. 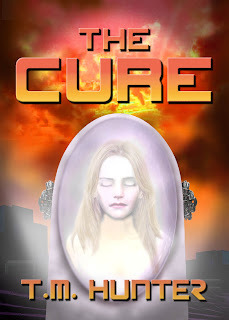 In the meantime, you could read the entire book, by picking up your own copy of The Cure. Be sure to go check out the rest of the Science Fiction Fantasy Saturday snippets. And again, I'd be remiss in not letting my legions of Aston fans know that although this is a standalone novel, it does come into play with a future Aston novel. So stay tuned! Yup. It's never a good thing when the zealots come knocking (they're always at my door 'warning' me too). Seriously though, great scene, great moment - naming her project by name. Those crazy zealots...I'm guessing they didn't bring religious tracts to share, huh? Exciting! But didn't she know that when zealots come knocking, you hunker down and hide under the window? Hehe. Good stuff as usual. Great dialogue choices. I like how blunt they are about the project, totally not what you expect from a zealot which just adds to their characterization. Great stuff! Makes you wonder what the project is about. Darn. Religious zealots are the worst. They do seem very well informed. I wonder how she'll deal with them. Pippa, they're very to-the-point, that's for sure. Man, that just sux when people don't keep secrets!